You’ve heard me say / complain that South Florida is flat. 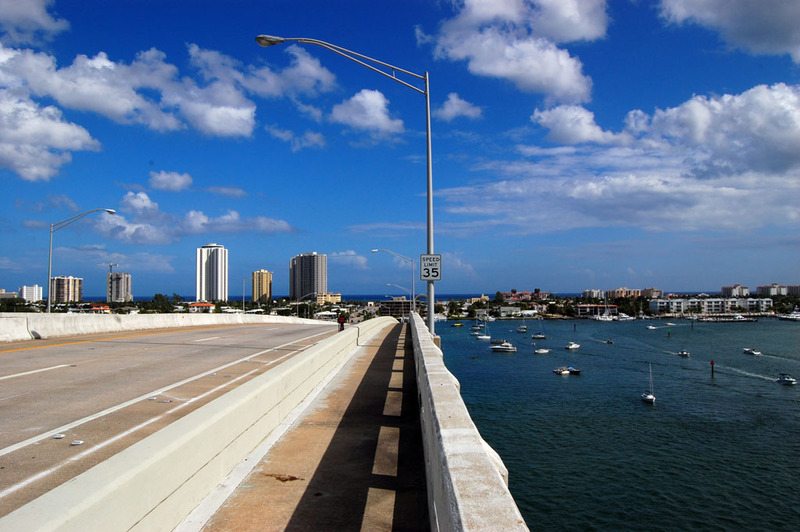 So flat that triathletes and other folks wanting any kind of climbing experience have to head to the Jerry Thomas Memorial Bridge, better known locally as the Blue Heron Bridge, which links Riviera Beach on the mainland to Singer Island on the ocean. 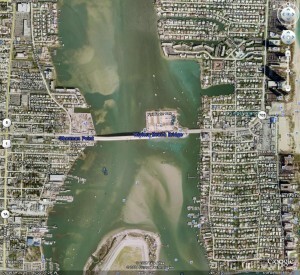 I made some calls to the Florida DOT, who looked at the bridge and agreed that it made no sense. I was pleasantly surprised to see how receptive they were to input. That bridge HAS to be safe, right? That’s what Palm Beach Post editorial writer Candy Hatcher thought. Here’s her story: I was shot on the Blue Heron Bridge early the morning of July 27, 1999 while training for a triathlon. I was running (slowly). The bullet, a .22 short, lodged about a half-inch from my femur. I went to four doctors, asking for it to be removed. All said leave it there; it’ll do less damage than disrupting the muscle tissue to remove it. From the start, it’s been much more of a psychological pain than a physical one. But I completed the triathlon (Siesta Key about three weeks later). Then I moved to Seattle, where there’s nothing but hills — and some of the best biking paths in the country. OK, but it’s got wide shoulders, right? New Year’s Day, 2000, was beautiful day, so Anna Redgate packed 2-1/2-year-old Whittaker and nine-month-old Grace in a red Baby Jogger and started walking the bridge. When they got to a traffic light, they stopped, waved to drivers at the light and started to cross when the light was in their favor. Suddenly a car blew through the light, stuck the stroller and crunched it against the bridge railing. I’ve seen a lot of bad things in chasing sirens most of my life, but I can’t imagine anything as horrific as Anna Redgate’s account. “I felt my body lunge forward into a sprint. Desperate to get out of the way, I pushed the children as fast as I could go. In that final moment, I felt the car come up off the road and along the left side of my body. The stroller was ripped from my desperate clutches and then everything stopped. Before me, facing me, were Grace and Whitaker. The driver, 65, had been on a two-day drinking binge; his blood-alcohol content was three times the legal limit. He was sentenced to 10 years in prison for DUI manslaughter, but died one week after being imprisoned. OK, but lightning won’t strike twice, right? Linda Taylor and Cynthia Andrews had a weekend routine where they would get up before the sun did and do a brisk walk back and forth over the bridge. Around 6 in the morning on Sept. 24, 2006, a hit-and-run driver struck and killed Andrews, 49, and her friend Linda Taylor, 56. Andrews was hurled from the bridge and plunged to a small beach below. Her friend, Taylor, was left dying on the asphalt. A teal GMC Suburban with significant body damage and two flat tires was found a short distance away. Investigators said the vehicle had to travel roughly 15 feet from the roadway to hit the women. The driver took a plea bargain that netted him five years in prison, 10 years of probation and a lifetime driving ban. You can read the whole story here. After that crash, the concrete barrier above was constructed to give protection to peds and joggers on the sidewalk. Ironically, that took just that much buffer away from cyclists. On a hot summer day in the late 70s, Palm Beach Post chief photographer Jose More and I were having lunch at Proctor’s restaurant in West Palm Beach when we heard a commotion in the parking lot. A husband had tried to run over his wife, one of the waitresses, in the parking lot. We chased the car on foot as far as we could, radioed the office to call the cops, and went back to lunch. Just as we were leaving, we got a radio call saying that some guy had called a clerk in the newsroom to say he was going to jump off the Blue Heron Bridge because he had tried to kill his wife. 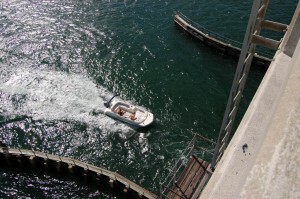 When we got to the bridge, I talked a boater into giving me a ride where I could see the man perched outside the railing at the highest point. A policeman started waving his arms at me. I assumed he wanted me to back off, so I told the boater to back up. The cop started gesturing to come closer. I wasn’t going to pass up an opportunity like that, so I had the boater pull directly under the span where I could climb a steel ladder going all the way up to the top. In those days, I don’t recall nice platforms along the way. I remember it as being a straight climb that went on forever. Remember, I said it was a hot day? I was carrying three camera bodies, a camera bag with more stuff and wearing a shooting vest filled with filters, light meter, spare film and no telling what else. About a third of the way up the ladder, I wondered how many more feet it would be before I cramped up and either froze to the rungs or got flipped free to sink like an expensive anchor. “I don’t think you’re with the press,” he growled. Eventually we managed to talk the guy into coming down off the bridge, and I got a very nice letter from the police department thanking me for my help. For some reason or another, though, they never asked me to teach negotiaing skills to the other officers. 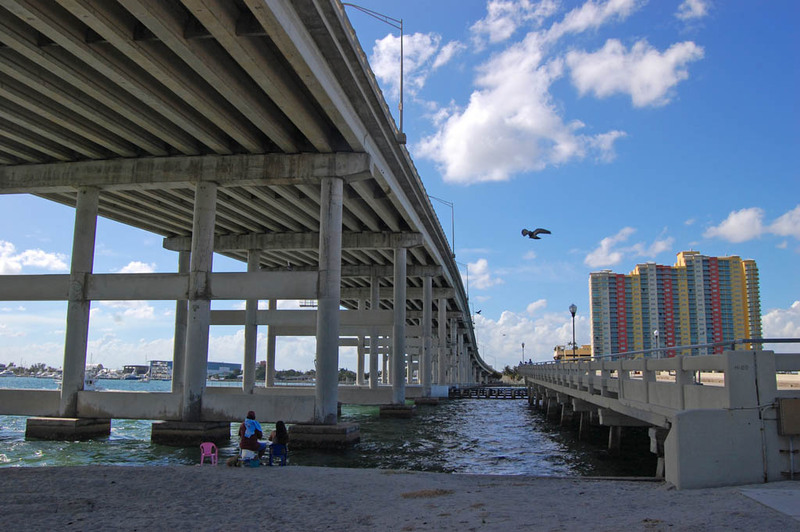 Under the east end of the bridge is Phil Foster Park, which has boat ramps, picnic areas and the remnants of the old bridge which have been converted to a fishing pier. It’s a great place to enjoy the breeze and watch boats go by. The brightly-colored multistory buildings on the right sit where the Crab Pot, a Palm Beach County institution, used to serve up inexpensive seafood. Just when I comfortable calling you a curmudgeon (wait, maybe you didn’t know that I call you that, oops) you go and pull out one of these great stories about how you talked a jumper down. As far as what I carry, let’s examine your argument. When I got on the boat, I assumed that I would need long glass because I was going to be quite a distance from the subject. And, had he jumped, I would have had to switch to a medium telephoto. Your way of thinking reminds me of this old man and woman I stumbled onto in Ohio. They were trying to build a whole cabin with nothing but a handsaw and a hatchet. They were getting it done, but I’m glad I couldn’t see it from MY house. Is the bridge historian guy picking up on this? Actually, I don’t care. This is great local history. And it is documenting the way journalism used to be done. I never heard the jumper story! It’s no wonder they pick that bridge to jump — it’s a scary sight looking straight down. I’m pleased to see that no matter how slow I went, I never walked my bike over that bridge — nor any other. I was almost backing up a few times, and wobbling fiercely on windy days, but never walked it! 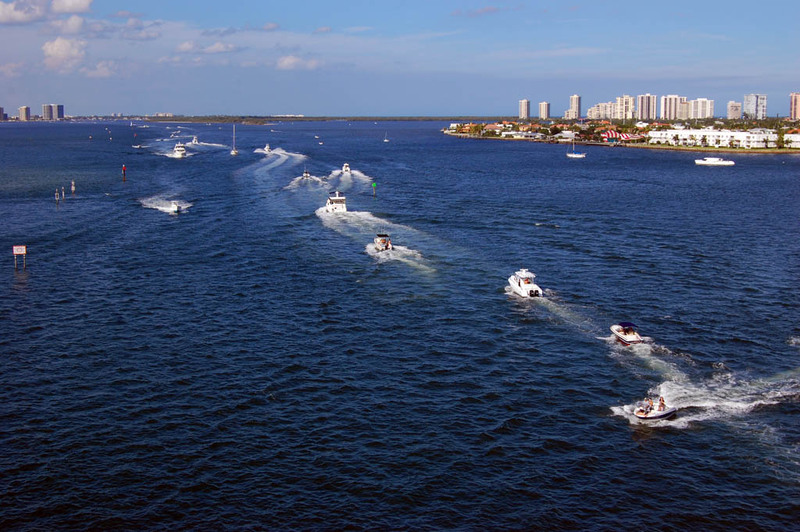 It’s always a beautiful sight, looking out over Peanut Island and the inlet and onto Palm Beach. The water is so blue — seems like the Chamber of Commerce set it up. That’s what I was thinking. This bridge is now a historic site. Lots of other places would be historic sites, too, if we had the stories to go with them. How about giving us the coordinates of that cabin in Ohio? I may want to see if it’s still standing. It took me a long time, but I think I may have finally crossed over to becoming Old Man Steinhoff, the guy in the neighborhood with all those crazy stories. The key is to wait until most of the folks who could dispute your stories are dead. I’ve noticed that my mother gets more colorful the older she gets. Once I get the decks cleared to do some photo scanning of my old Ohio days there may be a lot of places you’d like to check out. Thanks for this site- it is very interesting. 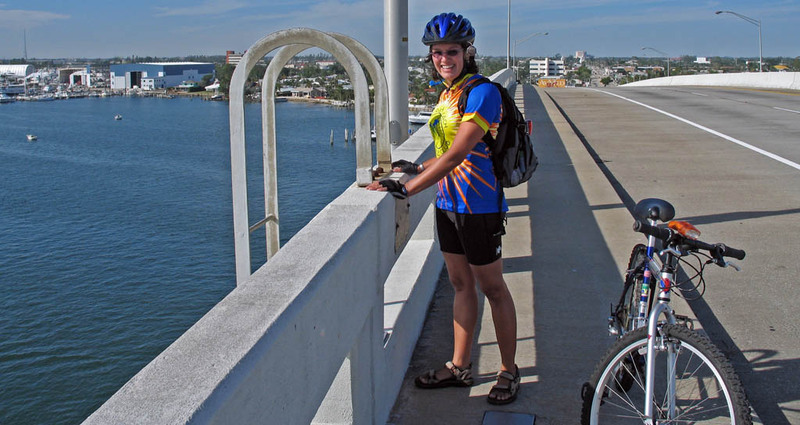 The Palm Beach Chapter of the Leukemia & Lymphoma Society TNT Program uses the bridge to train for our Century Rides. This past Saturday, I am proud to say, I rode over the bridge twice with my team. After the pedestrian accident in 2006, it was very difficult for me to find the nerve to ride over it. If Florida drivers would just remember to stay vigilant, keep their eyes on the road ( and not their cell phones! ), we would have far fewer pedestrian/bicyclist vs auto accidents. “Share the Road” means just that – we have our responsibilities as cyclists and drivers have theirs. Oh, and by the way, honking at a cyclist is NOT a good idea. It will not bother an experienced rider ( although it is aggravating to us) but an inexperienced rider may lose control of their bicycle. I’ve never been afraid of that bridge. Maybe climbing that steel ladder from water level showed me that there’s an even scarier side to it. Congrats on two laps of it. I usually don’t have too much trouble with it on the northbound leg of WPB to Hobe Sound, but I sure dread it and the flyover on the way back home. It’s really neat, though, when you catch a tailwind that lifts you right over it. Thanks for the congrats – I don’t think I could make it up that ladder so congrats to you! You did a good thing. 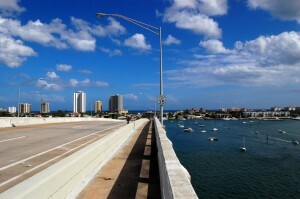 After we rode over the bridge, we were at the end of Palm Beach (at the inlet), looking across the water at the bridge and noticed it IS higher/longer going south. Boy, I would sure like to catch that tailwind – a tailwind is good anytime but especially over that bridge! A headwind on the bridge isn’t that bad because you’re shielded by the rise until you get ready to pop over the top. I’ve done it a couple of times in a strong cross wind and it gets a little iffy on the descent. I can never catch a break on the traffic lights. I always catch a red southbound just before the climb and on the way down. I don’t mind the one at the foot of the bridge northbound because I usually cut through some of the neighborhoods to get there and don’t have any speed built up. So, let’s talk about Water Tower up near Hobe Sound.. Now that is some hill! The next time we ride up that way I’ll take a picture for you. I used to ride Hobe Sound a lot, but I haven’t heard of Water Tower. I was often tempted to ride back by U.S. 1, particularly when it had been fresh paved. I thought those rollers around the LORAN tower would be fun. Traffic’s not that heavy and the shoulders are wide. The infamous ” Water Tower”. 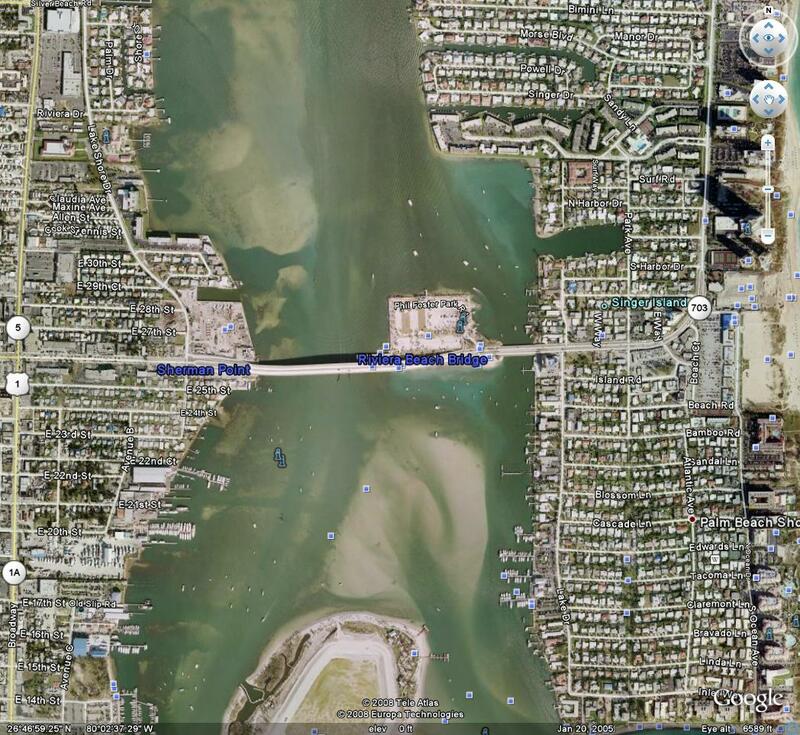 Jupiter Island north to Bridge Road – west to Dixie, then south to SE Water tower – turn right and be ready for a surprise! Here is the mapquest link. I’ll have to check it out. It’s logical that a water tower would be located on the highest surrounding terrain. What a great story…two of my favorite pasttimes…biking and chasing down local history. 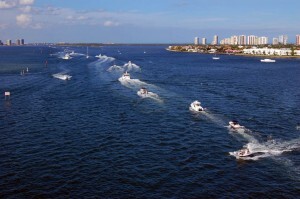 The Blue Heron Bridge is a favorite of scuba instructors. It’s an easy first shore dive. The water depth ranges from about 4-18 feet. Sea creatures are abundant amongst the bridge supports and a small reef near the Intracoastal Waterway channel. That is a scary bridge looking down. I’m not scare of heights in general but when it comes to water and a bridge. I start feeling dizzy and probably because I can’t swim too. haha Great story very well written. Previous PostPrevious Was there a Dolphin Football Game today?